One of the fastest growing industries in New Jersey and New York is solar. WIth very generous government incentives coupled with sizable private investment; solar is a very viable energy solution. Below is a point by point introduction and education on why solar might be a good option for you and why PowerLutions Solar is the best company to help you get there. We’ve been around for 10 years. Our focus has always been to bring the best value to the customer, while delivering the best possible solution to save the most money from their solar system. We are very focused on customer satisfaction and we always stand behind our product. What’s the first thing you need to know about solar? Solar will reduce the amount of electricity you use from your electric utility company since it produces electricity from the sun that you can use in your home. How does the sun produce electricity? On a basic level, the radiation from the sun causes the electrons on the panels to be excited and move, which generates energy and is converted to electricity. What about at night, or when it’s cloudy, how does the home still have electricity? You are always attached to the electric grid, so you always have a flow of electricity. That’s actually a two part question. When it’s cloudy it’s still possible to have some electricity produced, albeit a lower amount. 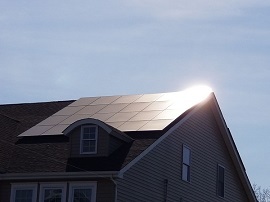 In terms of the nightly question; in New Jersey and New York, and in many States, there is something called ‘Net Metering’ which basically means that you get the full value of solar electricity. If you are not home and the sun is out and a minimal amount of electricity is being used, your meter will, effectively, go backwards. When you come home at night it will go forward again. You get the full value of the solar electricity and the grid is acting as a battery for the electricity produced that you are not using at that time. Doesn’t it cost a lot of money to install solar panels on my home? Yes and no. You can purchase it yourself and have it installed on your home, but there are different government incentives that lower the cost and allow you to recoup your investment at a much faster rate. We also offer great financing options with no money out of pocket and you can save money right away! In addition, PowerLutions offers solar lease and PPA programs. It costs you $0 to install and you would enjoy a very low rate on the electricity produced by the solar system. This option is also no money out of pocket and offers you to save a lot of money right away. What is the rate for the solar lease and PPA program? That depends on different factors, including: the pitch of the roof, position of the roof towards the sun, shade etc. The rate includes the Delivery and Generation portion of your bill so it can bring your utility bill down to a couple of dollars. We have several different options and terms. We have great no-money down options that allow you to save money Year 1. We have terms from 5 to 25 years. The financing allows the system to be paid for 100%, including the amount of the tax credit. Yes, when you purchase a solar PV system you get a Federal Income Tax Credit for 30% of the system cost. The financing option allows the tax credit portion to be paid for and, the idea is, you pay the financing company back when you get your tax credit payment, if you withhold, or save on paying the government the amount you would owe. Homeowners in New York State can also take advantage of State Tax Credits, up to $5,000. What if I don’t have a need for tax credits or I don’t want to be involved in dealing with a tax credit? The lease and PPA program is perfect for you! The leasing company takes advantage of the tax incentives and they, in turn, give you a great rate on the solar electricity. This allows you to utilize their ability to use the tax incentives and you save thousands of dollars! Aren’t you ruining my roof? No, we do not damage the roof. We use industry best practices to ensure a quality installation. We only use top quality components with our experienced installers taking extreme care to ensure the installation is blemish-free. All penetrations are sealed and flashed utilizing the same methods that a roofer would use if he needed to penetrate the roof. All roofs are reviewed and inspected by an architect or engineer in order to confirm that we are able to go ahead with the installation. We also procure all the required permits and approvals from the municipality and State, including all inspections. If there is a blackout can I still get electricity from the panels? Not in the traditional sense but we can install a special unit that comes with an outlet that can power up to 2,500 watts of power when the sun is out. This unit is optional. It can be useful for charging various electronics. It has a limited production value but it can go a long way when you need it. What are some reasons that people would NOT go solar on their home? We get that question a lot by people who are incredulous about how great the deal sounds and they wonder why EVERYONE doesn’t do it! Well, there are different reasons. One reason is their roof won’t support it, either because it’s too old or too much shade around the roof and they don’t want to trim anything. Another reason is they don’t like the look of it, although as more people are going solar we hear much less of that reason. It has become much more acceptable as more people do it. We usually use upgraded all-black panels that are more visually pleasing. If a person’s roof is 15 to 20 years old and it’s not old enough to replace the roof yet, what options do they have? During the sales process, they can request a one time removal and reinstallation so, when they get to the point of replacing their roof, PowerLutions will come and remove the system before the roof is replaced and reinstall it when the roof work is done. Yes, we can have the tree, or trees, trimmed or removed, depending on what the customer wants and the solar system needs. This is something that is discussed during the sales process. What if they don’t want to remove or cut any trees, does that make solar impossible? Depending how much shade the trees are causing. If it’s only minimal to moderate we can put solar, it will just affect the production. Send us your address for a No-Hassle roof analysis to see if solar is right for you.